This is the back of the next quilt I'm working on, this one is also undergoing a beading treatment on the front. I quilted and finished it today, and started adding beads. 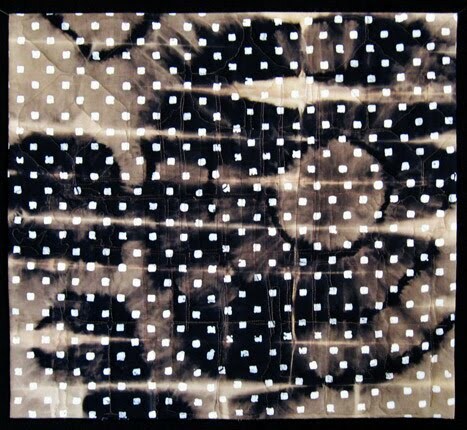 The fabric here is a piece of black cotton that already had the white squares on it. Actually the squares were batiked and the fabric dyed black, and I purchased it like that. Then I discharged it, probably about 18 months ago. I decided recently to start using my best loved fabrics -- after all, what the heck am I saving them for if not to use to create cool quilts? What better time is there than the present? If I hang on to the best stuff for too long, it's hard to justify making more wonderful fabric. So what I've been using recently are some of my favorite discharged pieces. I'll post the finished piece before the end of the week. This is the front of the quilt back shown last post, Going in Circles, just completed an hour ago. Turned out to be another major beading effort, but well worth it. I keep forgetting to measure my quilts, but this one must be 12 or 13 by close to 30 inches. The central image is a digital print on Osnaburg cotton, the other two major pieces are soy wax batik discharged. 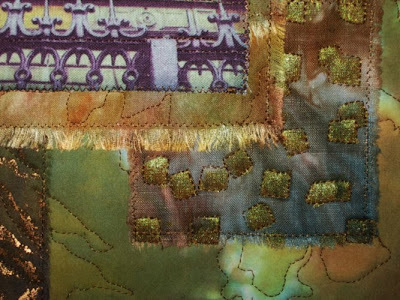 I tried several options for embellishing the digital image after quilting -- on test pieces, of course -- and beading turned out to be the best thing to do. The glass beads highlight the quilting design without obscuring the image in any way. I had experimented with light applications of metallic paint and metallic paintstix, but both were too opaque. And I had the perfect beads so it was a no-brainer. Still working on that deadline, tomorrow I'll start the second piece. I never did see Toy Story 3 on Saturday -- Small Town Living: I think the only 3D theater in Humboldt County is right here in Fortuna...Saturday their projector wasn't working! Thinking I'll probably see the movie tomorrow afternoon, unfortunately though, without my friend Vicky. This is the back of the quilt I'm almost finished with. I photographed it before adding the sleeve because the fabric is so interesting in its own right. It's a discharged cotton/rayon fabric. I'm nearly finished with the quilt -- all that's left is some beading on the front. I'm liking it. Today my best friend is coming up from her rural digs in Piercy, northern Mendocino County, for shopping and a movie. We're going to see Toy Story 3. I've really been digging the new 3D movies, have seen most of them now. Even if the sound volume is too low on the dialogue -- which it almost invariably is these days and which is why, with the exception of 3D movies, I don't go to the theater anymore -- the visuals are worth the price of admission. And I'm a visual, so there you have it! I feel remiss in not posting more regularly lately. I'm way under last year's posts to date, and last year I wrote maybe half the posts of the year before, my first year blogging. Still, I don't like posting without photos and I like to keep this blog primarily art related. Maybe I've run out of things to say, or perhaps I've just become more selective! It's just one of those times, I suppose. The fabric here is from my last print storm of several weeks ago. See the other fabrics here. 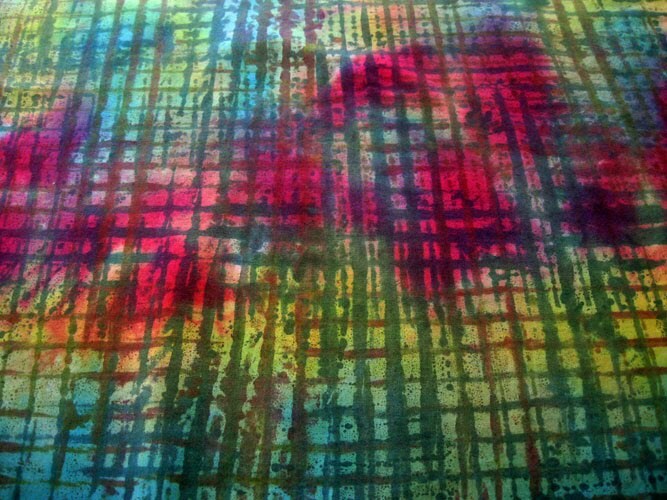 This was a piece of garishly dye painted muslin that I overprinted twice with thickened dyes. It'll probably be until mid-July before I do another round of surface design, and I think I'm going to focus on monoprinting then. Meanwhile, I completed Fiberactions' Memory quilt this week and I'm real happy with it. It turned out better than I'd imagined. Look for it to be posted here and on Fiberactions' blog on July 15. 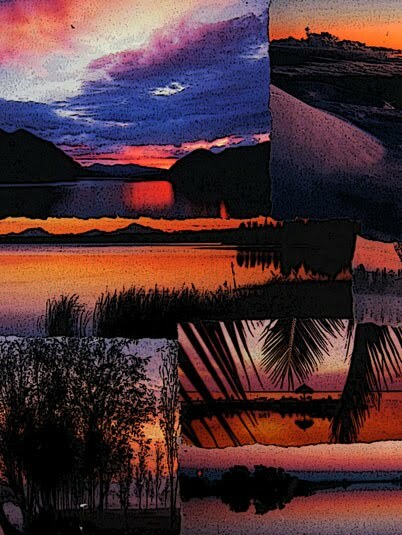 I'm working on the first of three bigger (for me) quilts with digital images...in fact, hoping to complete it this weekend before moving right into the second one. I have the next five days to make as much art as possible. I put in a bunch of time early this week tweaking our two new websites at work -- Sequoia Humane Society and Woofstock -- so I earned tomorrow off! Love those long, long weekends. So I'm hoping to have more to share here in the next day or two. Thanks so much for reading! 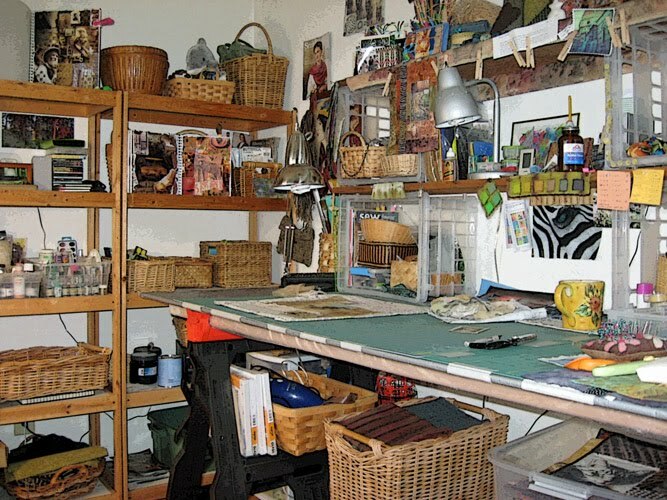 Sure glad I always have a cache of ready-to-post collages for times when I don't have fabric related photos! 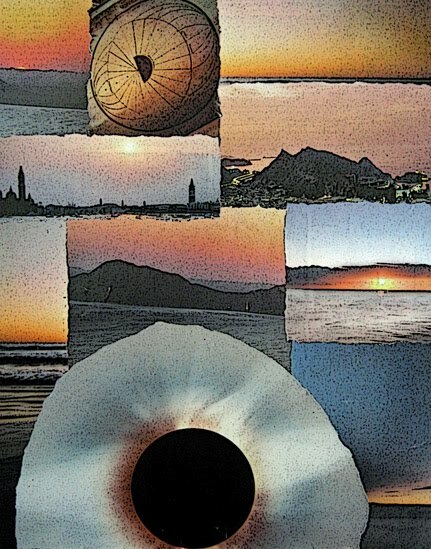 Speaking of fabric related photos, I've been doing some interesting things with photos of fabrics I've surface designed...and then I'm manipulating the images in Photoshop prior to printing them on fabric...and then I'm using the images as quilt elements. You'll see more at a later date -- right now I'm fine tuning the concept. 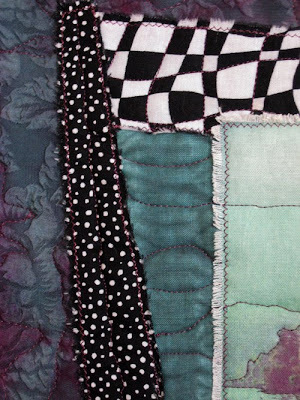 I finished designing the memory quilt today and started quilting it. Believe it or not, it will be entirely hand quilted! I'm really jazzed about it, it's a total departure from anything else I've done. The weather has turned nice-ish on the North Coast. It's been sunny, with no rain, but lots of clouds and quite windy. This may be what summer's like this year, just like it was last year. Oh well, at least it's dry -- i.e., not raining. I've been posting new work for sale at both my Etsy Shop and my Sales Blog, several times a week at each site, and different pieces. If you haven't stopped by either place in a while, please do so! My studio, earlier this week. Actually neater than it often is. Although it's a small space so I need to put things away as often as I can. I've been busy, gearing up for things to come. I have three medium-small sized (15 or 18" by about 25") quilts ready to quilt now and I really should get going on them. Other things keep getting in the way -- like designing the third of the bunch this morning. 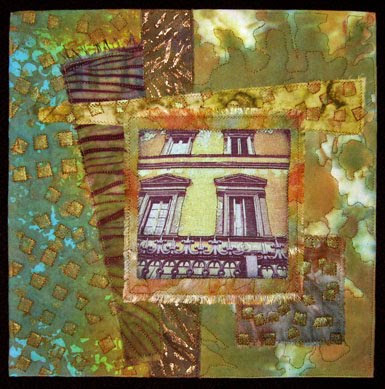 And working on those 12x12" Italian photo quilts I'm enjoying. And working on the Fiberactions Memory quilt. Speaking of that, the other day I said I'd be ripping out what I had quilted on that piece the previous day. I ended up dismantling the entire thing, right down to the constituent pieces of fabric that HAD been zigzagged onto the foundation fabric. But now I'm nearly finished redesigning it and of course, I like it a whole lot more than I did originally. Hoping to have it done by the end of this coming week. I mentioned recently that I was thinking about starting to teach, and toward that end I have put together a list of workshops that I feel competent and confident in offering. Follow this link to see the list of workshops. 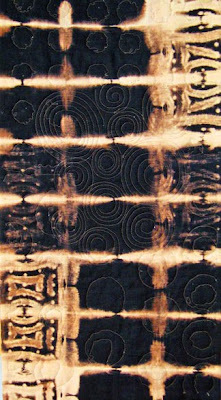 The only one that's scheduled is the Acid Dyeing Workshop in early August in Fortuna CA. I'm open and available for teaching anything on the list to your group or guild. For more information, please contact me. I realize there are numerous online venues these days for teaching classes...but I'm much more interested in doing hands on work with students than putting together an online, distance learning sort of thing...just in case you were wondering whether I'd given this any thought. I'm hanging a permanent show of my work this Monday, at Sequoia Springs Assisted Living Community in Fortuna. 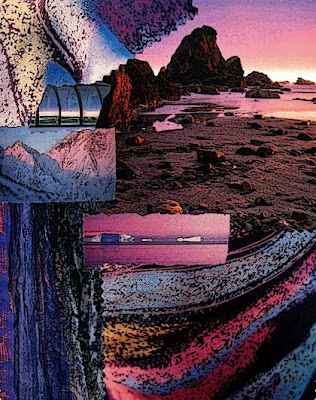 The community relations director there recently decided to jettison the reproduction art hanging everywhere in the facility and invited local artists to claim a wall as their own and keep it stocked with art for sale. And they'll be promoting this to the North Coast community by having an Art Show on Saturday, June 26 from 11 to 4pm. If you're in Humboldt County, plan to come on by and see all the fabulous local art! 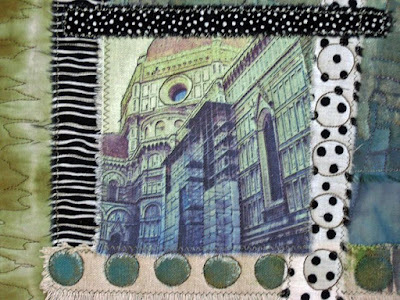 And here's number four in the series, called Florence Windows. I love this one -- I rather love them all! -- especially the background fabric on the left, a recently dyed/printed/stencil stamped piece. After much consideration, I decided to name the last piece, shown here, Descent to the Lake. I have another one of these ready to go, another one in process, and several more in the planning stage. They're very enjoyable to make, I like the way my unusual fabrics set off the digital images. Today I began quilting my Fiberactions memory challenge piece, due July 15. But I'm pretty sure I'll be ripping out most of the quilting tomorrow morning...it wasn't really what I wanted when I left the studio today. Sometimes you just have to jump in and try something before you know for sure whether or not it satisfies your vision. But kudos to me for being gutsy enough to just go for it! 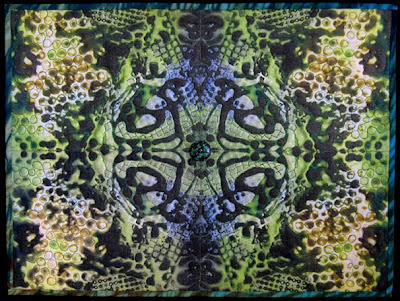 The third installment in this growing series, completed today but not yet named. It's 12x12" and it'll be mounted on a stretched canvas this week. The image is of the south end of the town of Menaggio, on Lake Como. The background fabric is silk, a lovely jacquard piece I bought eons ago and dyed sometime late last year. I just love these deep, rich colors. 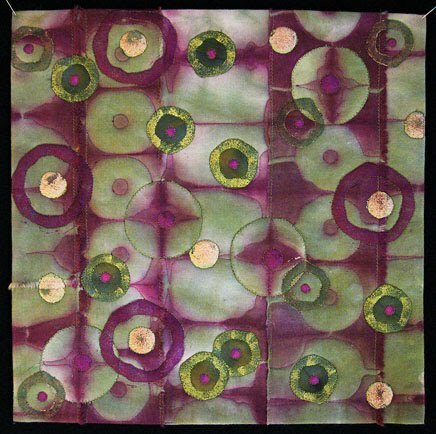 Speaking of silk, I'll be teaching an acid dyeing workshop - Colors to Dye For - the first weekend of August, in Fortuna, CA at April Sproule's studio. 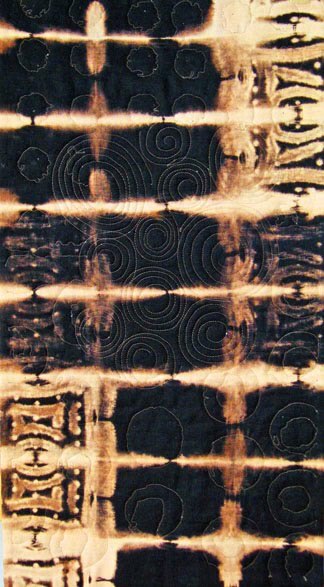 Acid dyes are what you use on protein fibers including silk (although fiber reactive dyes can also be used on silk), and they are the dyes that I originally learned how to dye with. 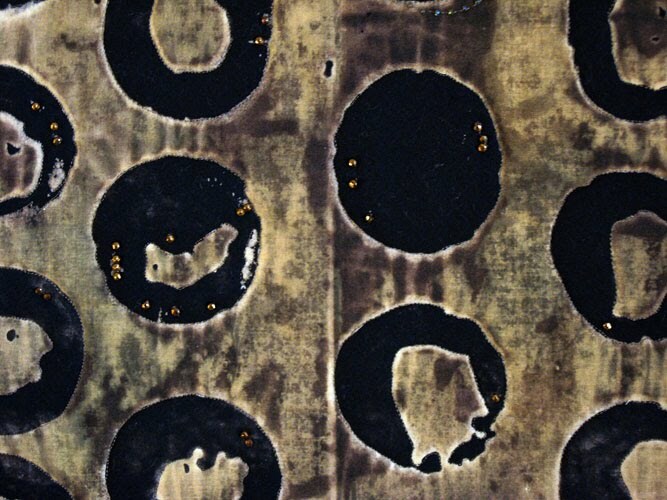 Acid dyes are less tricky than fiber reactives and produce brilliant results on protein fibers. If you're in Humboldt County or you'll be traveling here in early August and would be interested in taking the class, email me for more information. The class is half full now, I have space for 4 or 5 more. With a quick phone call late last week I arranged two local shows of two months each for 2011, both at popular eateries in Humboldt. It's good to have a couple shows to work toward. And otherwise, I'm expecting my flagging creative energy to surge again soon. All of a sudden there's a brand new template widget on Blogger that rivals anything else I've seen. I'm blown away by the possibilities, right here on Blogger! I've spent much of the last week designing new pieces and prepping them to be quilted. The tops themselves sometimes take days or weeks to ponder over until I'm satisfied, and then the rest goes quickly. 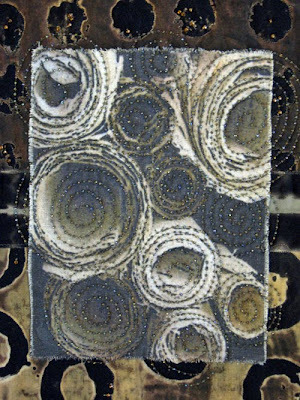 And, as seems to be my fashion, I like having a small stack of work to quilt one after the other. Maybe I'll start on these this weekend -- maybe not, we'll see. I've been in a bit of an artistic funk lately. It's not the "lack of inspiration" kind of funk, more like the "what the heck am I doing and where am I going" kind of funk. 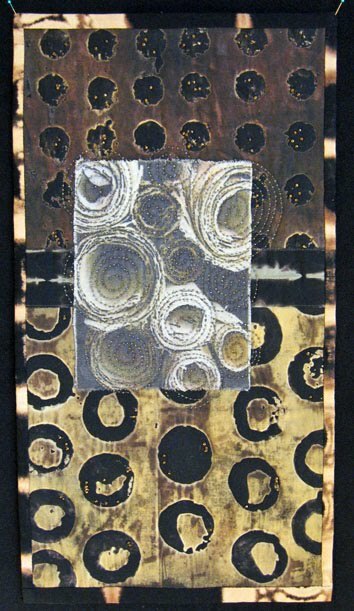 I really like my work, my surface design and my art quilts, and apparently a lot of other people do as well -- at least they tell me so. But I have always had an enormously hard time selling my art, whatever medium I've been working in. I've always had an inclination to sell because 1) I produce a lot of work and I want to get it out there, and 2) I am frequently encouraged by others to do so, or to try, anyway. But all the marketing and networking and friending and connecting I've done over the years in an effort to sell myself and my work, all the Open Studios and Open Houses and Arts Alives and Art Shows, all the mailing list building and postcard printing and event inviting, and all the press release sending and online venue developing, has netted me nothing, really, in terms of building a base of clients or customers or supporters. It's really been demoralizing. I live in an area of the country where there are maybe five artists to each potential art buyer in the county...where tourists to our area want to buy inexpensive artsy stuff...where there are no decent art shows at any time during the year...where there are no real galleries and thus virtually no dedicated gallery space. And this is what it was like before the economic downturn! And speaking of the economy, there seem to be signs of recovery all over the U.S., at least according to the multitude of artists who's blogs I read, who have successful weekend art shows, numerous and regular customers for their wares, well-attended gallery shows, ad infinitum. I guess the point I'm trying to make is that while other artists seem to be expanding in countless ways, I find myself having to contract just to stay afloat in the world these days. Because everything I've attempted in the way of getting my art out there -- for at least the last ten years -- has disappointingly failed as well as virtually bankrupted me. So I'm left thinking, maybe what I do ain't so great, after all. My intention here is not to do a "woe is me" kind of thing, rather to get a grip on What's So, insofar as my art life is concerned. How it's been for me is How It Is. This has been my reality as an artist. I admit that I feel angst over the whole scene, of which I like to think I am a participant, but from which I usually feel more like an outsider, because I haven't yet found what works for me...and I often wonder if I ever will. I've begun considering other options with my art, maybe teaching workshops and writing more...channeling that creative energy in new ways for me. So stay tuned to see what develops. And thanks for coming along with me. 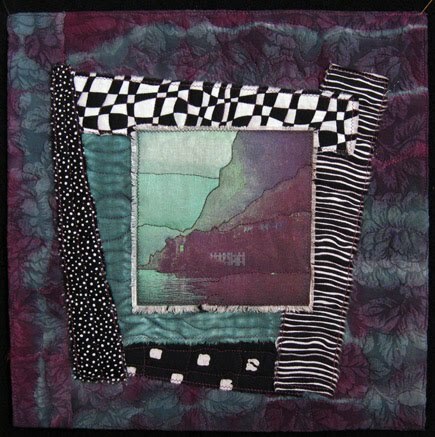 For the second month, now, I have a show of my work at Eureka Fabrics, 420 2nd Street in Old Town Eureka. I hung an additional six pieces yesterday, and I'll be there this evening for Eureka's Arts Alive! 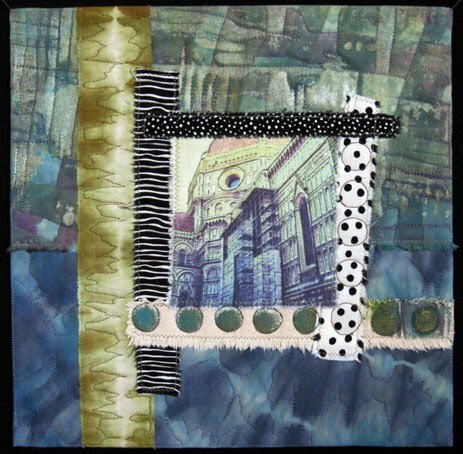 The show includes some recent art quilts, some from last year including Overlooking Eden above, and two pieces of handwoven artcloth. If you're in Eureka, please drop by this evening and say hi! I'm also having an Open Studio Sale this weekend and next, Saturday and Sunday both weekends, 11-5 pm all days, at my studio in Fortuna. Circles 2, above, is just one of the many pieces I have for sale and on sale (meaning at a significantly reduced price). If you're in the area this weekend, or traveling here next weekend and you'd like to stop by, email me for directions and info. Hope you have a great weekend -- looks like we're in for more rain. Something tells me it may never stop raining this year...I hope I'm wrong! 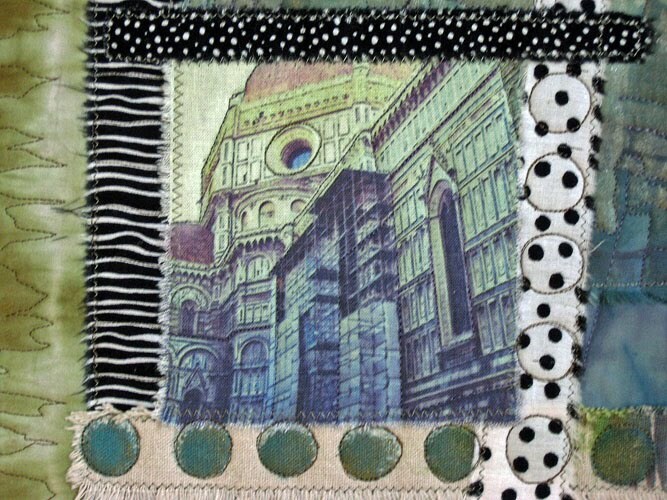 My next 12x12" piece, completed today -- Il Duomo, Firenze. This, too, will go on a stretched canvas. I think this and the last piece are the start of an Italian image series. I spent most of the holiday weekend in studio down time...meaning I rested a lot, read, napped, and generally felt unmotivated. At least I know, now, that these relatively fallow times are just moments between my usual productive activity, and not a trend I need to be concerned about. Fiberactions' latest quilt challenge, to be revealed July 15, is memory, and I've been working on it in the back of my mind for a couple of weeks. I've begun to put a few ideas down on paper thus far. I really enjoy the process of producing these group challenge quilts, because I like the way I work on these types of things. 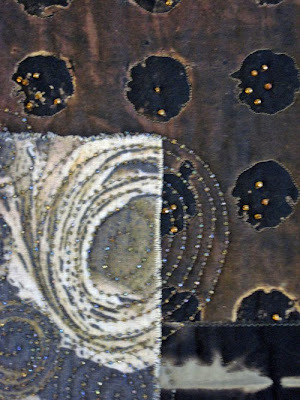 The theme presents itself to me amorphously, step by step it becomes concrete and I play with different possibilities at articulating it in fabric, then eventually it materializes into a finished piece. I'm working on other projects as well but haven't felt much like talking these days. I'm just doing the work that's in front of me.